iPhone 5 rumoured to be joined by new range of iPods | What Hi-Fi? The iPhone 5 is set to be launched this Wednesday 12th September and according to rumours it could be joined by a new range of iPod devices. 9to5mac reports, albeit in a rather vague manner, that it expects two or three, new or updated iPod lines, with a range of colours and storage capacities promised. That site's money seems to be on new iPod nanos and iPod shuffles, with the iPod touch and iPod classic set to be left alone for now. The iPod classic hasn't been updated since September 2009, and even then it was essentially only a change in storage capacity to the current 160GB model, so a new iPod classic looks unlikely. 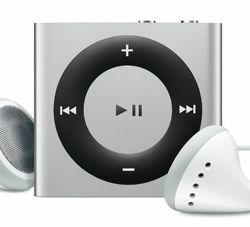 Both the iPod nano and iPod shuffle were updated back in September 2010, with the iPod nano getting its compact design and multitouch screen, while the iPod shuffle reverted to its stripped-down design. An iPad mini looks more likely to be launched in October, getting its own launch event as opposed to sharing the stage with the iPhone 5.